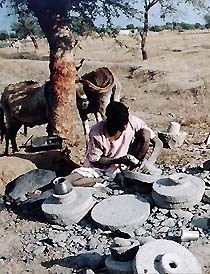 There was a Kumbhar, a potter. He had a donkey. This donkey kept on insisting that it wanted the King's daughter as its wife. The Kumbhar thought that were the King coming to know about the obstinacy of the donkey, then "the King will kill me." The Kumbhar as a consequence decided to leave and quit the town. There was only one Kumbhar in the town. It was therefore ordered by royal decree that he should not leave the town. The Kumbhar was called to the palace. The King asked him the reason for his leaving the town. The Kumbhar then told the whole story. The King told the Kumbhar that if "your donkey builds a city of brass and copper in one night, then I would give my daughter to the donkey." The Kumbhar told the donkey what the King had said. The donkey erected a city of brass and copper in one night. The King gave his daughter in marriage to the donkey and built a palace for them in the forest. Everyday, in the middle of the night, a horse would descend from the heaven. The donkey would then become a prince, ride the horse and go around the whole world. One night, the queen woke up and saw this happening. The queen asked the donkey to tell her the true story. Then one came to know that the donkey was a form of the god.